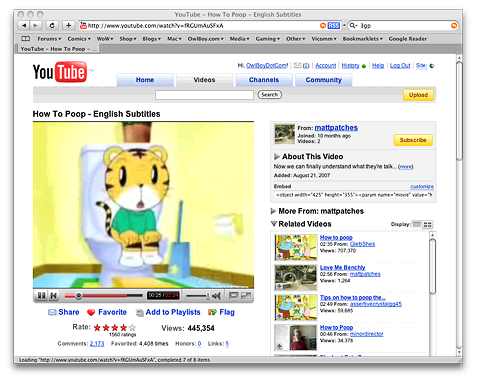 Today in class I figured out how to Get a YouTube video on a Verizon Cell Phone for Sam. I thought I would create a little tutorial for him, and others and place it on my site. So here it is. A Phone that supports 3GP video playback and receiving. Get the video from YouTube. Using safari go to the page for the video you want. Find the file in the list that is the biggest. This should be the only file that is over 1mb in the list. Hold down option and double click the link in the list. This will download the file to your default download location. It will be named “get_video”. Go into the Finder and rename the file to something ending in flv. Convert the file to a format you can use on your phone. Open the newly renamed .flv file in Quicktime Player. Using the timeline select 29 seconds of the video you want to use. (I say 29 since the limit is 30 seconds, and just 1 frame extra over that limit will cause it to be too long. Thus 29 seconds keeps you safe. Create a new player from the file menu (Command-N) and paste (Command-V) the video into it. Go to the end of the video and verify that the time is indeed 29 seconds or less. From the Export format menu select “3G”. And then click options. Now you need to set up the specs for the video. I found that the default bit-rates and formats worked on the phone I was doing this with, so I recommend using those. I also found that the newest version of Quicktime updated the 3G capabilities and formats. So if you are using a version below 7.4 the dialogs might look a bit different than mine. 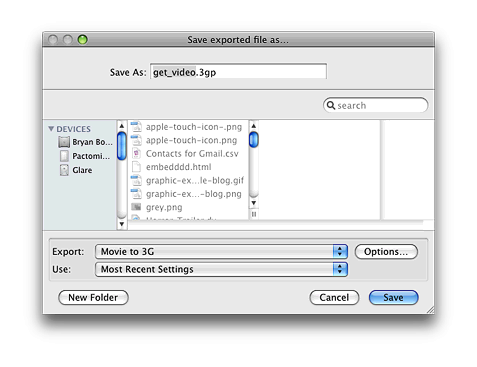 Select ‘3GP’ or ‘3GPP (Mobile MP4)’ (depending on your quicktime version) from the File format menu at the top of the 3G Export Settings dialog. This should in both cases set all the default settings needed to export. Below I have a screenshot of the settings just incase. Click OK and then Click Save. Once finished encoding you should have a video file ready to send to the phone. Send the video to the phone. Head over to https://picture.vzw.com/ and click “Send a Message” over on the left. Click ‘Upload Media’ located at the bottom of the left column of the interface. Follow the dialogs to pick your exported video and upload it. Once uploaded drag the preview of your video over to the area on the right and enter any text you want to send along with it. Click Preview & send. On the next dialog you will enter the number of the phone you are sending to and an optional additional text message. Click send and it should send. This might work for sending to other carriers phones. You would have to test to see. It might be verizon only. And if that is the case there might be other services out there that let you send 3GP videos to phones on those carriers. This will work with other settings and 3g2 videos. Though this depends on the phone you are sending to some can’t play all file types, or bit-rates. So play with increasing the bit-rates and sizes and 3g formats to see what works and what don’t. 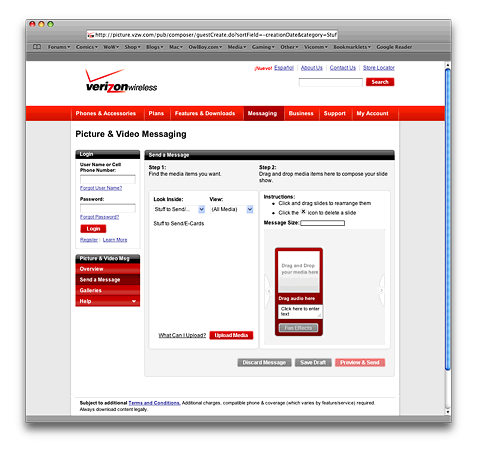 Remember the Verizon site limits the file size to 3mb. So you might be able to get some clips looking really good. You never know. I just don’t have any phones handy to test with. There are other ways to get the FLV from YouTube. The method shown here is just a quick and easy one all Mac users can do. KeepVid.com is another way to download the FLV. There are other ways to encode to 3g other than Quicktime with Quicktime Pro. I don’t know them off hand, but this will work with those too as long as the produced 3g videos are of the proper specs. Remember there are fees related to messages and data on phones. So don’t go crazy with this unless you know what your rates are, or the rates of the person receiving the video. I hope this tutorial is found to be useful in some way. Apologies if something is unclear. Ask in the comments and I might be able to help. Remember that Perian is the only way you can open the FLV in Quicktime, and it needs ‘.flv’ at the end of the file to open it. This entry was posted in Internet, Media, Movies, Tutorial and tagged 3G, 3G2, 3GP, 3GPP2, Cell Phone, Mac, Mac OS X, Macintosh, Mobile Video, mpeg4, Tutorial, Verizon, video, YouTube on January 25, 2008 by Bryan Bortz. That’s kind of intense man. I would never have even thought about going through that much effort for something like that. Its cool that you figured it out though. lol, so true, so true.